I get completely overwhelmed with my to do list when I don't have a list written out. I am such a visual person, I have to be able to SEE what I have to do all in one place in order to prioritize and create a plan of action. My friend Lecy at A Simpler Grace blog is so good about setting monthly goals, she encouraged me to do so as well. So, why then, did I set goals? 1. So I have a list of what I'd like to accomplish. It helps me to prioritize what I want to focus on for the month. 2. It cut down my list of priorities by giving me a narrower focus - just a few things at a time to tackle. 3. It's good practice and gives me a reason to make it a habit. As a SAHM, sometimes I have a difficult time having a reason TO do something. I work well with guidelines and timelines and when I don't have anyone checking up on me, I sluff off. Setting goals gives me something attainable to work towards, like a timeline would. 4. Other people can see what I'm working towards and cheer me on. I know, not all goals are necessarily ones to broadcast, but for me, I like doing things WITH people and knowing that there are others out there sharing goals, it's kind of like this fun little unspoken club of goal setters! 5. Goals make it easier for me to remember WHAT I want to accomplish and it gives me all of those great old endorphins to check something off! All of these reasons could be your reasons that goals work well too! 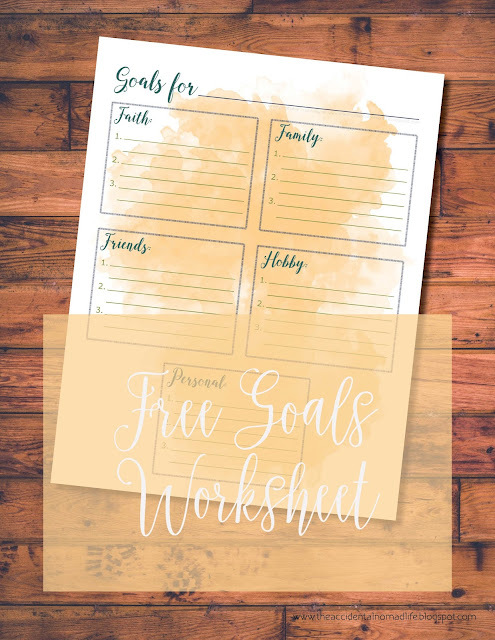 In honor of forgetting my goals and needing something extra visual for them, I created a little printable to use for next month and I want to gift it to you to use as well!!! Please only use it for personal, do not sell it or there'll be a whole mess of trouble between you, me, and whoever made the graphic on it - it's for personal use only. If you share it, please link back to this post instead of the Drive file...Thank you for being considerate! Watch next week for my goals for March and a photo of my goals sheet! If you use the sheet, please share a photo on Facebook or Instagram and use the hashtag, #tANLfreebie, also be sure to tag me (@theaccidentalnomadlifeblog) so I can like your photo too!!! Thanks Kayla! I love it! I'm so proud of you for putting yourself out there and setting some goals!! It's been such a help for me to have mine listed on the blog every month where I have a list and where my friends can hold me accountable. Great job!